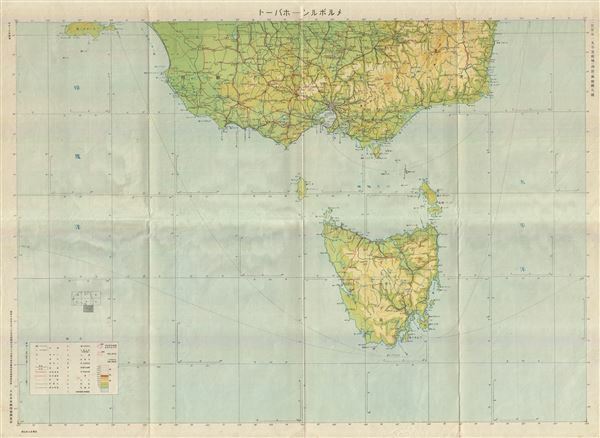 This is a scarce 1942 or Showa 17 Japanese map or chart of Tasmania and Victoria, Australia by the Imperial Japan Government Land Survey Division. The map covers all of Tasmania or Van Diemen's Land as well as Victoria and parts of New South Wales and South Australia. This World War II era map is highly detailed and notes rives, towns, shipping lines, and a host of other topographical features. While Allied World War II maps of this region are fairly common it is extremely rare to come across their Japanese counterparts. All text is in Japanese. This map was issued by the Imperial Japanese Government Land Survey Division in 1942. Very good. Minor wear along original fold lines. Minor overall toning.